A breeze blew through the trees beside them and the odor of pine and sage was whisked up to her. She loved being up on the rock, the feel of the hard surface beneath her fingers. Even though she knew accidents happened - horrible falls when anchors didn't hold or problems when a belayer's attention was diverted - she felt secure somehow. The rock she clung to had withstood so much, it was stable, stability that in the past had seemed hard for her to find. Her legs started to quake again and before Kurt could even call up advice, she moved to straighten them. Soon Abby was at the same place where she'd fallen moments before. She passed by the knob, realizing it was turned in such a way that when she applied more pressure for the move she couldn't hold on to it, and continued to search e for a better one. To her left, and just out of her reach, was a ledge that looked perfect. Abby scooted each of her feet as far to the left as possible and then tried again to grab the ledge. Her fingertips could just touch it. She stretched even more against the rock. Above her she heard a shriek. A red-tailed hawk circled over. Abby straightened her legs again, checked her hand hold, took a deep breath and then lunged with her whole body to reach the ledge. Her fingertips grasped it, but then couldn't support the rest of her body and she fell. Abby is about to lose her reception position working for a guiding company, along with her dreams of owning a home. Fate steps in. Suddenly she is in a position to save her job. All she has to do is guide an author and magazine photographer into the backcountry of Yellowstone - an easy task and an opportunity of a lifetime. Only on the trail her group meets up with Dennis, a man who has just robbed, not one, but two local banks. Dennis is determined to escape with all the money. He just has to make it to Idaho through Yellowstone without getting lost or injured. And he knows just the person to ensure his safety. 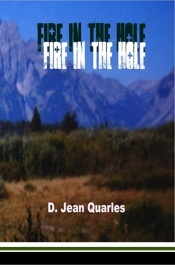 Filled with action and breathtaking scenery, Fire in the Hole will captivate you. I think I've read all of Quarles' books. This has high action, mystery and good intelligent plot. Strong female character contending with nature and an evil captor: how can you miss with a plot like that? Exciting read. Loads of suspense.